So here we go again, only this time, you’re not hearing my past experiences but rather what I’m seeing right here and now. I am once again at the Turner Classic Movies Classic Film Festival in the heart of Hollywood, California. And as I am righting this, I am currently waiting in line for my first film of the day. The weather of course is ideal. And so far Hollywood Boulevard is relatively quiet. The festival itself has been going on for two days now, but because of work, I could only attend this Saturday. Unfortunately that mean missing out on some exciting events earlier in the festival. This year’s festival opened on a high point this year as Hollywood celebrated the 50th anniversary of the classic musical The Sound of Music (1965), with stars Julie Andrews and Christopher Plummer in attendance. Other screenings that I would have loved to have seen were a screening of The Man Who Shot Liberty Valance (1962) with a discussion with Keith Carridine and also a screening of Chaplin’s Limelight (1952) with 100 year old Norman Lloyd in attendance and Apollo 13 (1995) with Captain Jim Lovell. As for today, I am choosing to open my day with a screening of John Huston’s The Man Who Would Be King (1975), with a discussion with Christopher Plummer. It’s a film that I have yet to see, so I’m looking forward to it, especially since it gives me another opportunity to see Mr. Plummer, a legendary actor in person. I will continue to update the rest of the day with my personal accounts, including pictures. Hope you all enjoy reading this. And now, showtime. First show complete and already I’m glad I made it. The Egyptian Theater was packed this morning, but even waiting in the standby line I still managed to get a seat. The show was preceded by a short introduction by film critic and historian Leonard Maltin, who of course was there to discuss the film with the special guest, Christopher Plummer. Mr. Plummer arrived to thunderous applause as he walked up towards the screen and once seated, the interview began. Maltin of course touched upon some of Plummer’s extensive career, but the discussion quickly moved on to the film in question. Plummer discussed briefly how he prepared for the role of Rudyard Kipling, the author of the story on which the film is based, detailing how he formed the look as well as his vocal performance. The conversation then turned to Plummer’s experience working with John Huston. Plummer of course found his experience working with the legendary director to be very rewarding, though Huston was also quite intimidating as he recalled. He offered a funny anecdote about a particular shot in the movie where a camel in the background was being a particular nuisance. But instead of accommodating Plummer’s concerns about the shot, Huston instead argued for the camel’s sake, saying that he had just as much a right to be in the picture as anyone else. Plummer also detailed his experiences with the film’s two leads, Michael Caine and Sean Connery, which was basically an account of a lot of off-set drinking. Overall, the presentation was excellent, and Christopher Plummer was as great as you would expect. I can definitely tell you after seeing him in person that he looks great for someone with as many years behind him. Still very sharp and with a lot of energy, and he brings with him a fantastic set of life experiences that have in turn become some legendary stories. What I especially liked from his interview in fact were his impersonations of the people he worked with, specifically Connery and Huston. His John Huston impression was especially spot on. The movie itself was also a delight. Presented with an original 35mm print, I’m glad that I waited until now to watch this movie on the big screen. Connery and Caine are wonderful in the film, and Plummer adds some great scenes in his brief role. Well, the first movie is in the books. Now I’m headed across the famed Walk of Fame to my next show at the legendary Chinese Theater. Over at the Chinese Theater, I managed to catch a whole different type of show from the first. In this case, a musical. The show in question was the 1972 film adaptation of the hit Broadway musical 1776. It’s a film that I have seen before in parts, but never from beginning to end, so this was a perfect place to finally catch the entire thing. The film has recently received a full 4K digital scan and the Chinese Theater’s IMAX projectors perfectly represented the glowing restoration that’s been put into the film. Though I believe the number of audience members was roughly the same as my first movie, the theater wasn’t quite as packed this time and I attribute that more to just the sheer size of the venue. Luckily, I was there early enough to get a good seat; about halfway down in the auditorium. Like the first film, 1776 had a discussion beforehand with people involved in its making. Hosted by TCM’s own resident host Ben Mankiewicz, the special guests were the film’s director Peter Hunt as well as the actors who played the lead roles of John Adams and Thomas Jefferson; William Daniels and Ken Howard respectively. The three men recounted their experience working on both the film and the stage musical from which they were all carried over. Peter Hunt talked extensively about having to deal with edits to the movie that were ordered by the producer Jack Warner after then President Richard Nixon expressed displeasure at some of the film’s more political undertones. Thankfully, years later, the edits made it back into the film, which was the version we saw this afternoon. With Daniels and Howard, they detailed their experiences on the set as well as how this movie helped to launch their film careers. Mankiewicz even noted that Daniels has since had a long history with John Adams, even being a teacher on the show Boy Meets Worlds named after the founding father. The whole show was excellent and the movie looks beautiful and holds up very well. Though I’m not a particularly strong fan of movie musicals, I do consider myself a history buff and this movie does an excellent job of presenting a historical event in an entertaining way. And also watching a movie made for the big screen, in all its Panavision glory, is a delight. So, two movies down and now it’s off to the next one. I tried to go from this screening into another one in the Chinese Theater, but the line was too long for me to get a standby seat. That show in case you’re wondering was a screening of The Apartment (1960) with special guest Shirley MacLaine. 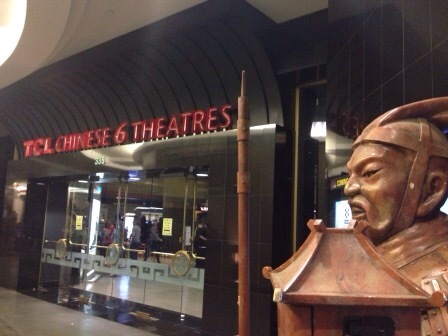 So, instead I’m watching a film in one of the smaller Chinese Cineplex behind the Dolby Theater (home of the Oscars). That movie is a lesser known film starring Marlon Brando and Anthony Quinn called Viva Zapata (1952). Show’s starting soon, so I’ll be back. The screening of Viva Zapata began with an introduction by actress Ileana Douglas who invited the special guest present for the film, Anthony Quinn’s widow Kathrine Quinn. Mrs. Quinn talked extensively about her life with Anthony and what he was like as a husband and a father to their children, proving to be a ball of energy even into his late 70’s and early 80’s. Her stories were especially entertaining and gave us a great picture of the man that Anthony Quinn was. The best stories however were the ones that related to the movie itself. According to Kathrine, Anthony and Marlon did not get along well on set, and that tension was something that director Elia Kazan milked for the benefit of each other’s performances. This kind of knowledge helped to give the audience a nice little insight into the methods of both actors, and it was kind of an extra delight to see both men messing around onscreen, knowing how much they hated each other. The movie itself was one I haven’t seen and overall I thought it was okay. Brando’s attempt at a Mexican accent was a little distracting and it is far from his best work. Quinn on the other hand felt very natural in this film, and it’s easy to see why he won an Oscar for his work. For one thing, I can see why TCM chose this movie as part of this festival, given that it fits within the overall theme of “History On Film.” Still, the movie felt a little stale after the highly entertaining 1776 and The Man Who Would Be King. But it was still worthy of catching at this festival. So, now I have one last opportunity to watch a film tonight and right now I am in line to enter the Chinese Theater once again, this time for a screening of 1971’s The French Connection with director William Friedkin in attendance. Well, it’s been a long day, but the night has come to an end. The French Connection is a film that I have seen before, but never on the big screen. 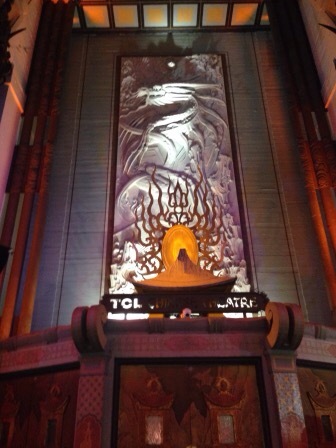 The presentation in the Chinese Theater was still a great experience and it was almost like watching it anew. It holds up very well, especially with Gene Hackman’s Oscar-winning performance and that legendary train sequence. After the film, actor Alec Baldwin was brought out to conduct the interview with director William Friedkin. Now while everything Mr. Friedkin said was fascinating, he could also go off on many tangents. The Q&A went for nearly an hour after the movie ended and it touched upon everything about the movie, Friedkin’s filmography, and his method of direction. It was easily the longest interview I witnessed today, but it was still enlightening nonetheless. The end of the show concluded with audience questions and one question was even asked by Boyz in the Hood director John Singleton. His question was regarding the film’s unique sound design, which is naturally the kind of question one acclaimed filmmaker would ask of another filmmaker. Overall, a nice high point to end the night. I hope all of you enjoyed reading this live blog of mine. Pretty remarkable that this worked considering that I’ve had to write this thing on the fly and on my smart phone this entire time. I hope in the years to come I can do more than one day at this festival. There are so many other good movies to see and so little time. If any of my readers are in the Los Angeles area, this is a festival that I strongly recommend catching. There are still some shows playing tomorrow, which closes out the festival. Anyway, this has been a good day for a classic film fan like me.